KANSAS CITY, Mo. 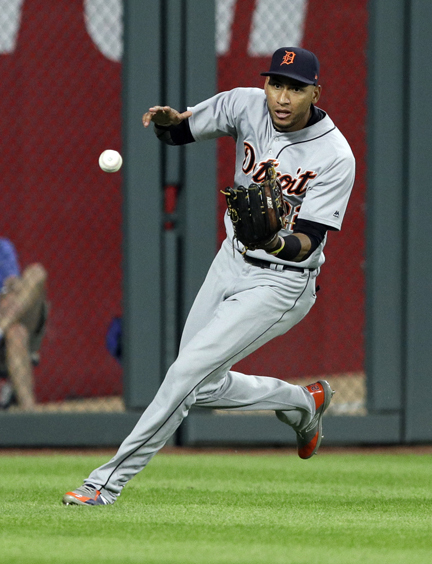 (AP) — Not since a week into the season had Detroit found a way to win when trailing after eight innings. Jim Adduci delivered a two-run double in the ninth and scored the go-ahead run on James McCann’s double as the Tigers rallied for a 5-4 victory over the Kansas City Royals on Monday night. It was only the Tigers’ second victory in 50 games and the first since April 5 when they won after trailing entering the ninth. Jeimer Candelario singled and Victor Martinez doubled to start the inning before Adduci came up. After Adduci’s double off Brandon Maurer tied it, Jason Hamel replaced Maurer and gave up a first-pitch RBI double to McCann, his third hit, to put the Tigers ahead. “I’m assuming if the velo(city) was good and I was getting hit, it was probably location,” Maurer said. He had retired 15 in a row before walking Martinez with two outs in the seventh. After Adduci dumped a single down the third-base line, Kevin McCarthy replaced Fillmyer. McCann and Jose Iglesias delivered run-producing singles.